We interviewed Ronald Kouvelt of EduTech startup StuComm. The company was founded just eight months ago and is ready to become student communication market leader in The Netherlands. What makes them so successful? StuComm wants to facilitate communication between students and educational institutions. To achieve this, they are listening to the students’ needs for mobile access to grades, schedules and course enrolment, while at the same time providing universities and schools with the right kind of tools to communicate with students. 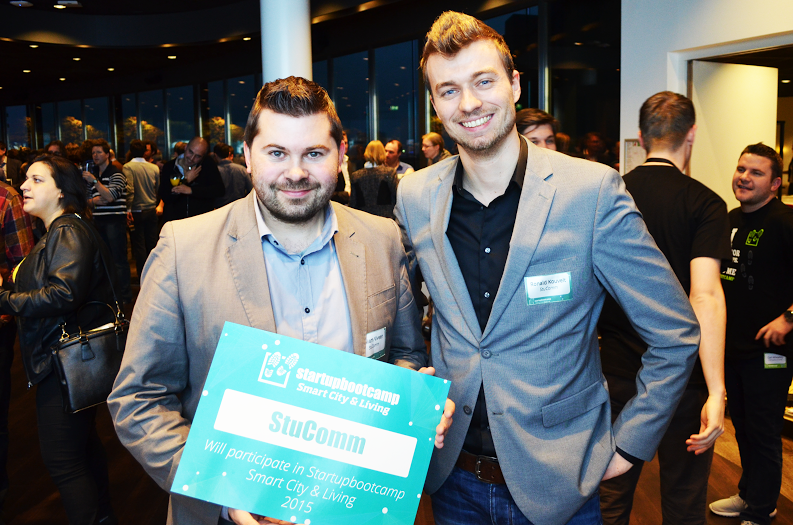 StuComm was founded by Ronald Kouvelt and William Viveen in 2014. Just months later, they enrolled in the Pressure Cooker programme of Utrecht-based incubator UtrechtInc and were named the best startup of the programme. Still operating from their UtrechtInc office at the Utrecht University campus, StuComm was recently admitted to the Startupbootcamp Smart City & Living accelerator programme. Together with ten other startups, they prepare for demo day on the 3rd of July. We have no real competitors. StuComm fills that gap by providing students with an app that does it all: grades, schedules, cancelled classes, enrolment, the latest news from school management, you name it, StuComm can implement it. The data for all this comes from databases filled by the educational institutions themselves, but also from the afore-mentioned systems like Osiris and SharePoint. Schools and Universities are willing to pay for this. Right now StuComm has contracts with several schools and their student app has between 18.000 and 20.000 users. Educational institutions are willing to ‘grant’ startups like StuComm the business they are getting, so to say. The feedback function Kouvelt is talking about, provides the students with a set questions in a Tinder-like interface, allowing them to give their feedback on all kind of topics, by swiping them to the left (no) or to the right (yes). Being based on the Utrecht University campus makes it very easy for StuComm employees to visit the Hogeschool Utrecht or Utrecht University to talk with students. One of those students came up with this idea: what about implementing a step counter? Because when you are walking between classes, you are burning a lot of calories. You see, StuComm is not all serious business, there is also the fun aspect. When a student opens up the app five times during the night, he gets the ‘night owl’ badge. Thomas Neuteboom, StuComm’s lead developer came up with the idea of gamification. Kouvelt: “When you are entering the city of Utrecht, a sign shows your driving speed, together with a happy smiley when you are not speeding. This is a form of direct positive feedback, and that’s what we wanted to implemented in the student app as well. When a student opens up the app five times during the night, he gets the ‘night owl’ badge. And when finishes his first year at university, there is confetti and a cup. We are thinking about adding more competition elements, for example a competition between classes of a school. Educational institutions have to pay for games? The StuComm products look highly scalable, easily transferable from one educational institute to another. There could be possibilities in both The Netherlands as in the rest of Europe. Maybe startups should also try to help each other a bit more, without expecting something in return.